Tropica?s CO2 diffuser contains a bubble counter and diffuser in just one unit. The bubble counter enables easy and accurate CO2 dosage, since it is easy to count the big bubbles inside the chamber during adjustment. A reflux valve prevents the bubble counter to run out of water, if the CO2 supply is suspended. The reflux valve does not secure your CO2 bottle or the solenoid valve. 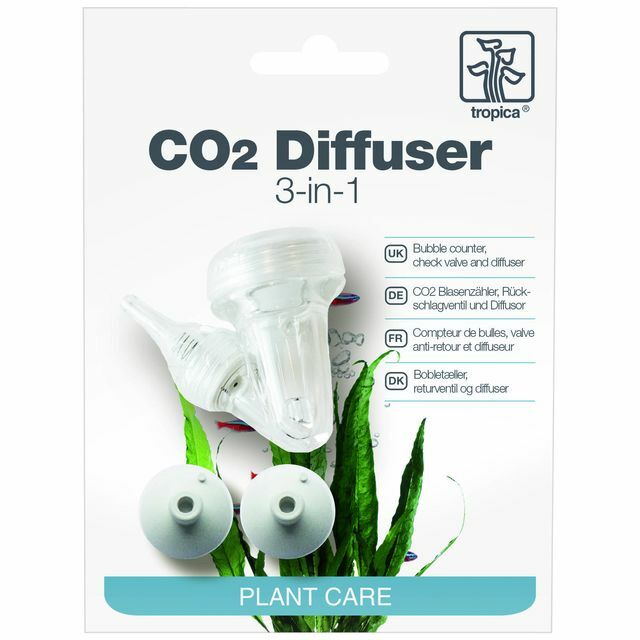 Small CO2 bubbles are distributed in the tank and guarantee an optimal CO2 uptake by the water plants. In order to ensure perfect adherence to the glass, make sure that the glass is clean and grease-free; apply an ultra-thin layer of Vaseline on the suction pads to ensure adherence. Once the diffuser is removed for cleaning it does not reseal anymore. Huge bubbles form between the plastic cap and the diffuser rubber that no longer seals. If you disassemble to clean you can throw it away. I do not know who is responsible for designing these products but better to dedicate to something else. Ich bin absolut begeistert von dem Diffusor. Ich hatte vorher einen der nur Pfeifgeräusche gemacht hat und den Blasenzähler außen am Cube.Wenn die Pflanzen noch höher wachsen,fällt er noch weniger auf.Die Bläschen sind auch extrem fein und lösen sich daher recht schnell im Wasser.